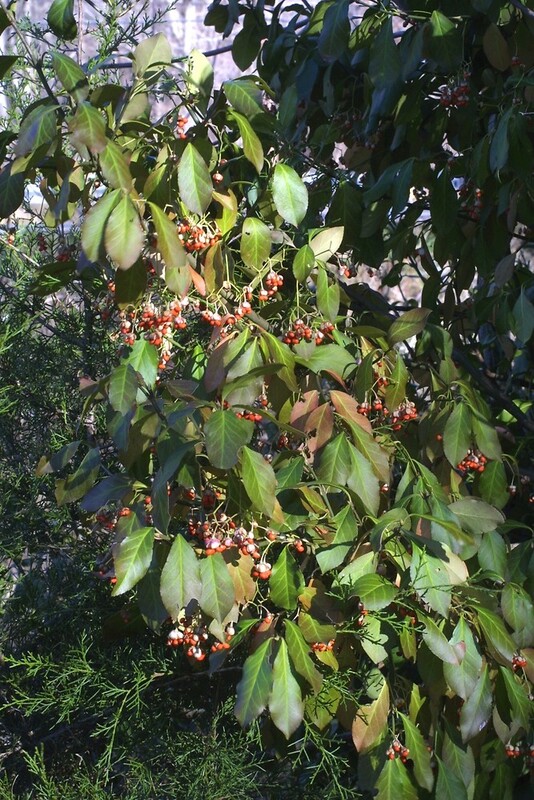 Climbing spindle-tree is a non-native species with orange fruits that can be dispersed by birds. 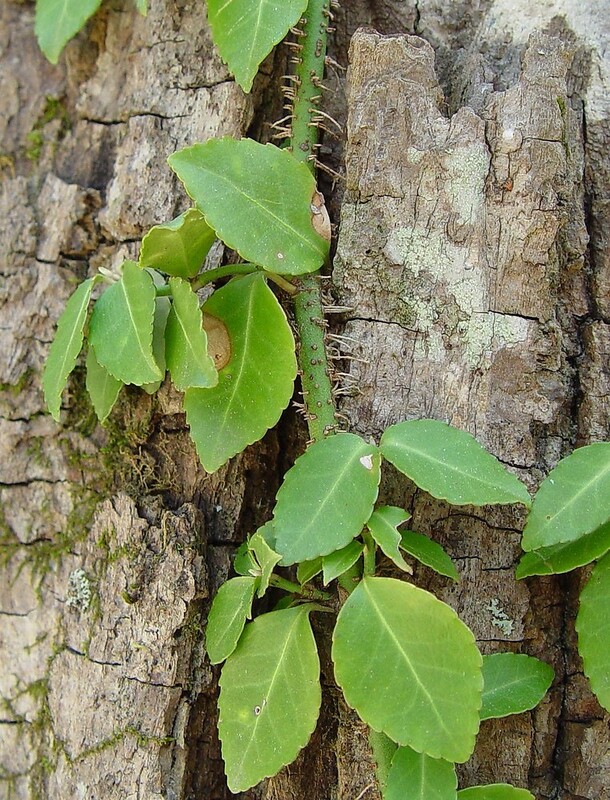 It has two forms that have been collected in the region: a liana that climbs on other vegetation by means of aerial roots and an upright or spreading shrub that does not climb. 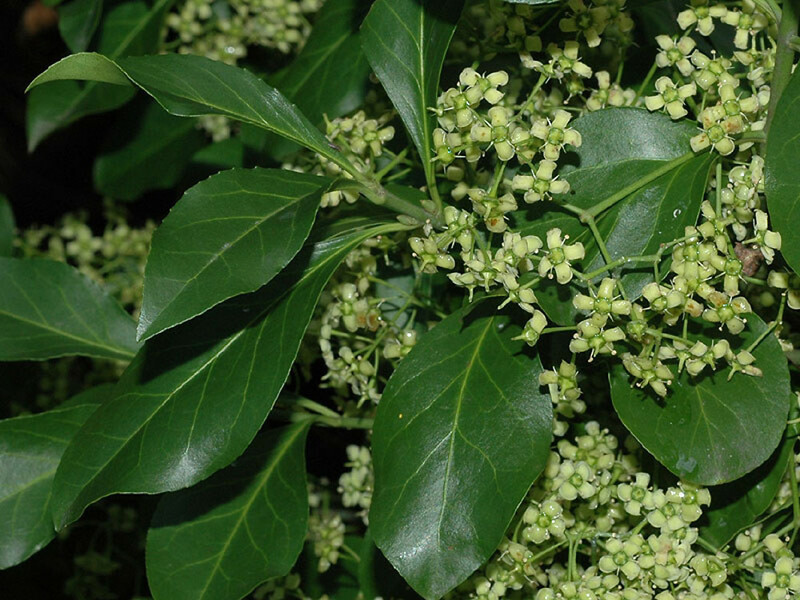 First introduced to the United States in 1906 as an ornamental, many variegated cultivars are available. 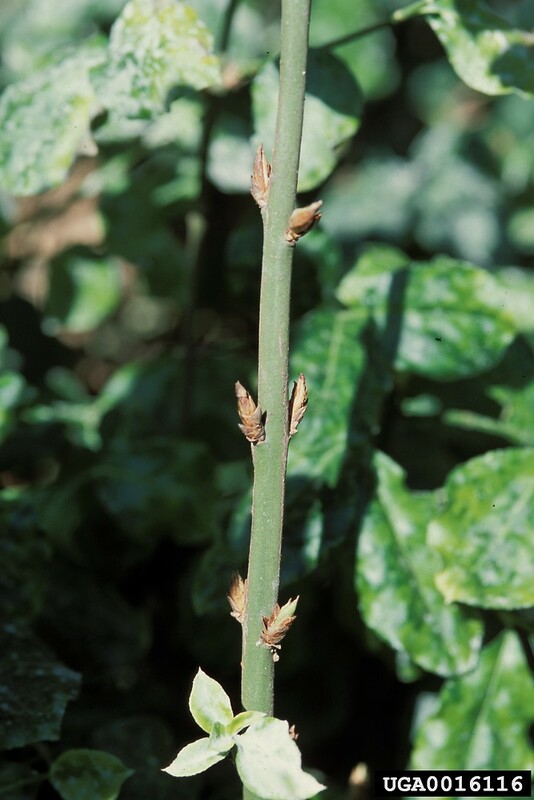 While it has been found naturalized in New England away from the cultivated setting, most populations appear to planted individuals that have persisted after or spread from cultivation. 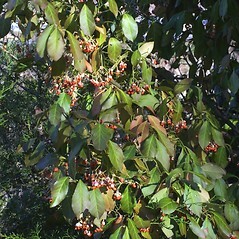 Euonymus fortunei var. radicans (Sieb. ex Miq.) Rehd. 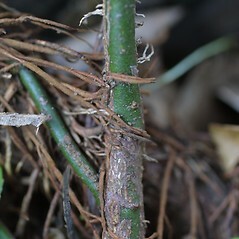 Euonymus fortunei var. vegetus (Rehd.) Rehd. 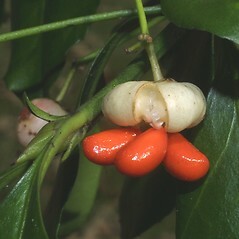 Euonymus radicans Sieb. ex Miq. 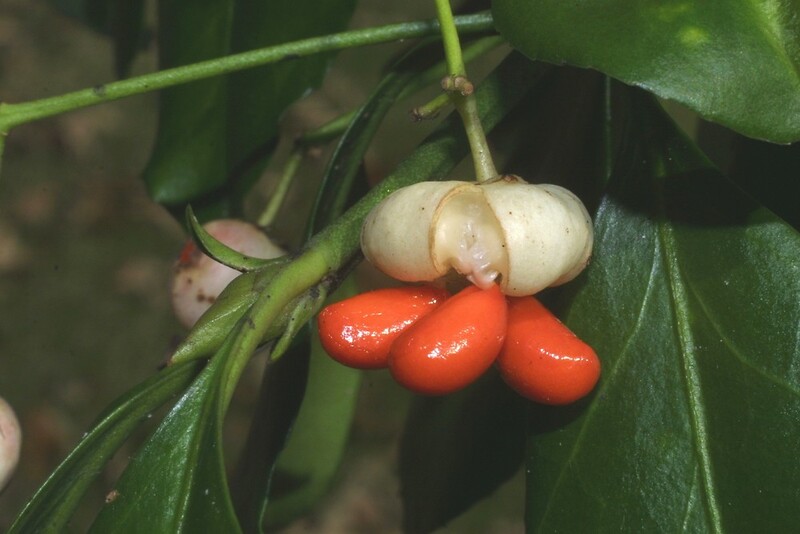 Euonymus radicans Sieb. ex Miq. var. vegetus Rehd. 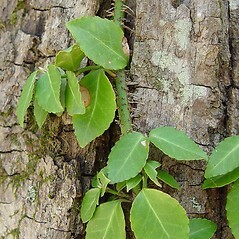 climbing spindle-tree. 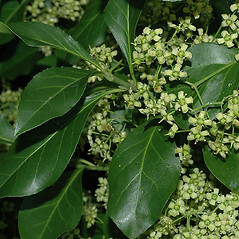 Euonymus fortunei (Turcz.) Hand.-Mazz var. radicans (Sieb. ex Miq.) Rehd. ; E. fortunei (Turcz.) Hand.-Mazz var. vegetus (Rehd.) Rehd. 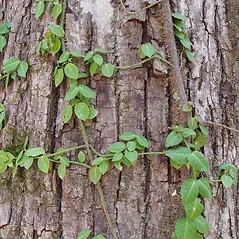 ; E. radicans Sieb. ex Miq. 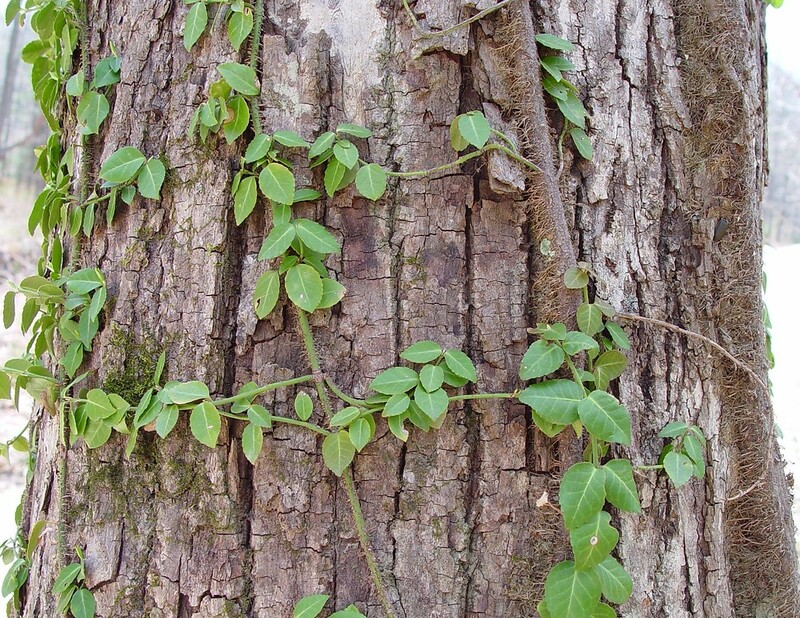 ; E. radicans Sieb. ex Miq. var. vegetus Rehd. • CT, MA, ME, RI, VT. Roadsides, forest fragments and edges, areas of habitation. 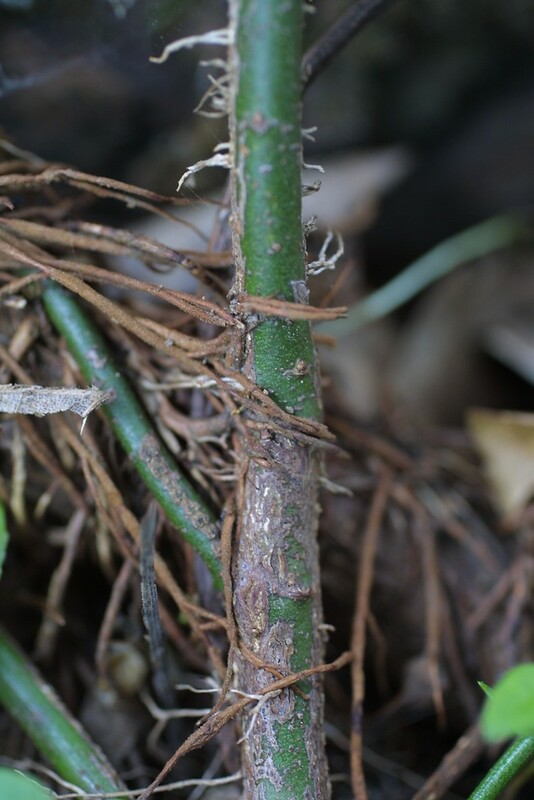 The common form of Euonymus fortunei that is found naturalized in New England is a liana that climbs by means of aerial roots and has prominent, light-colored veins on the adaxial surface (especially the midrib). Non-climbing forms are known from at least MA and have been reported as var. 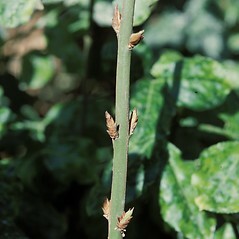 vegetus by Sorrie and Somers (1999), which is a cultivar of this species.